This was requested by one of my good friend so please take time and participate to this brigade. It wouldn't hurt a lot to help out our one and only leader, right? Hope you can also spread the word to make him no. 1! 김현중 화이팅!!!!! 2. 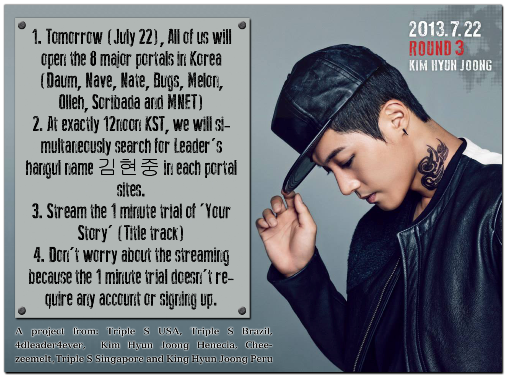 At exactly 12noon KST, we will simultaneously search for Leader's hangul name 김현중 in each portal sites. 4. Don't worry about the streaming because the 1 minute trial doesn't require any account or signing up. The goal of this project is to put Leader's name in all Trending lists and charts. We need to do this because the 1st one hour after the release of 'ROUND 3' is always the crucial. This will only take 10-15 minutes of your time so there's no excuse not to do this. BIG NOTE: We have to do this brigade all at the same time to achieve the trending!